Writing in the Journal of Dentistry, the researchers said: "Many epidemiological studies show a high prevalence of tooth wear, even in young patients. "One factor that may be contributing to this problem is the consumption of herbal teas that are often considered to be 'healthy' alternatives to other beverages." The researchers measured the acidity of a range of different herbal teas. They found that levels varied widely. Some had low pH levels which means they were acidic and could damage teeth. Others had high pH levels suggesting they were alkaline and did not affect teeth. But overall, the researchers found that many of these teas eroded tooth enamel. In fact, some were up to three times more damaging than orange juice. "Many of the herbal teas tested were found to be more erosive than orange juice," the researchers said. Dentists generally advise against drinking too much fruit juice. The sugars in these drinks are known to cause teeth erosion. They suggested that dentists who treat patients with tooth erosion should advise them against drinking herbal tea. "This information will be of use to clinicians when counselling patients with tooth surface loss," they wrote. However, one of the UK's leading manufacturers of herbal tea, Twinings, rejected the claims. 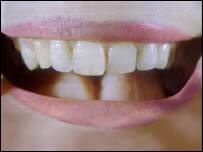 A spokesman said: "To suggest that drinking fruit tea could be detrimental to teeth is exactly the same as suggesting that eating an orange will damage one's teeth - a suggestion that we all know to be wrong. "Indeed fruit and herbal teas have been proven to have many benefits to mind and body." He added: "We believe that consumers should not be concerned, as when consumed normally, any acid remaining on the teeth will be neutralised by the saliva in the mouth."